He and the team then used confocal microscopy to observe the cells grown in various configurations of fine fibers, some random, some precisely arranged in meshes of different dimensions. The large number of resulting images were then analyzed and classified using artificial intelligence methods, to correlate the cell types and their variability with the kinds of microenvironment, with different spacings and arrangements of fibers, in which they were grown. Cells form proteins known as focal adhesions at the places where they attach themselves to the structure. "Focal adhesions are the way the cell communicates with the external environment," Tourlomousis says. "These proteins have measurable features across the cell body allowing us to do metrology. We quantify these features and use them to model and classify quite precisely individual cell shapes." For a given mesh-like structure, he says, "we show that cells acquire shapes that are directly coupled with the substrate's architecture and with the melt electrowritten substrates," promoting a high degree of uniformity compared to nonwoven, randomly structured substrates. Such uniform cell populations could potentially be useful in biomedical research, he says: "It is widely known that cell shape governs cell function and this work suggests a shape-driven pathway for engineering and quantifying cell responses with great precision," and with great reproducibility. 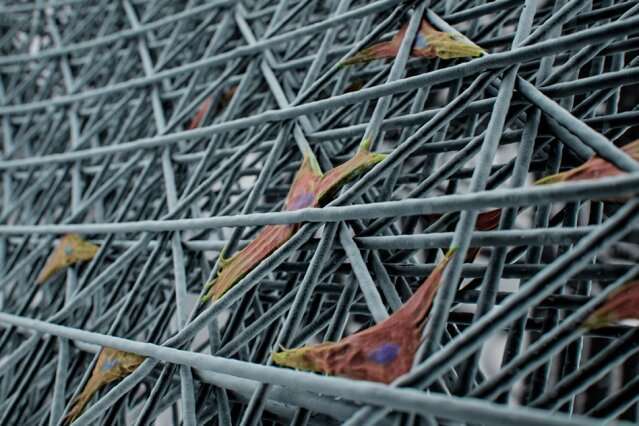 He says that in recent work, he and his team have shown that certain type of stem cells grown in such 3-D-printed meshes survived without losing their properties for much longer than those grown on a conventional two-dimensional substrate. Thus, there may be medical applications for such structures, perhaps as a way to grow large quantities of human cells with uniform properties that might be used for transplantation or to provide the material for building artificial organs, he says. The material being used for the printing is a polymer melt that has already been approved by the FDA. The need for tighter control over cell function is a major roadblock for getting tissue engineering products to the clinic. Any steps to tighten specifications on the scaffold, and thereby also tighten the variance in cell phenotype, are much needed by this industry, Tourlomousis says. The printing system might have other applications as well, Tourlomousis says. For example, it might be possible to print "metamaterials"—synthetic materials with layered or patterned structures that can produce exotic optical or electronic properties.